When you are choosing carpet for your home there are many factors that come into play. Some of those factors are dictated largely by the use of the room - looped carpets last longer in high traffic areas than plush velvety carpets. Other factors are guided by your personal preferences. Color is one of the biggest decisions when it comes to carpet and one solely guided by your own tastes. How do you pick the color of carpet that's best for you? 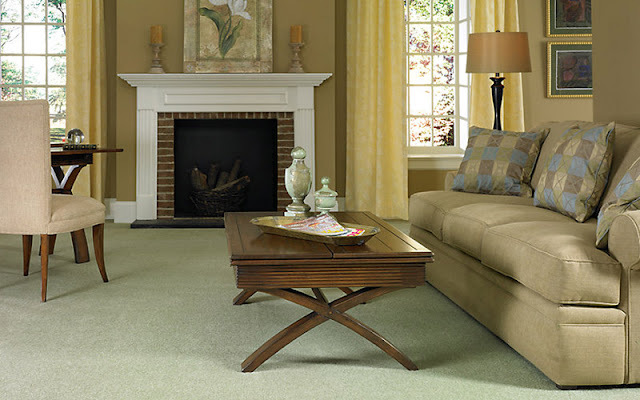 Are you placing the carpet in a room that already has furnishings? If so, you'll want to select a carpet color that complements what you already have in place. That's not to say that you have to pick the exact same color you had previously. Nor do you have to pick one that perfectly matches. You could select a color that contrasts what you have nicely or that picks up on a design element and ties the room together. Carpet by its nature is going to last in your home for approximately 10 years. After that it's going to show signs of wear in the padding and fibers. You shouldn't be afraid of choosing a color that seems trendy. If you like the color and it matches your style and home, it's okay if it's trendy because by the time that trend passes you'll be ready for new carpet anyway. From design stalwart, Pantone, to leading flooring manufacturer Shaw Floors - the color of 2017 is green. Vibrant or soothing, the shades of green easily lend themselves to both bold statements and near-neutral options. If you're looking for new carpet, consider checking out some green options. You might be surprised at the range of shades and fall in love with a brand new carpet. Wish you had some additional design guidance to find the shade of green carpet that's just right for your home? The flooring designers at Kermans are ready to help. Their consultation services are free and can help you narrow in on the perfect flooring choice.